There once was a saying among contractors that went, “It’s not if your skylight will leak, it’s when it will leak.” Fortunately, advances in skylight design and installation practices have made this old saw as useless as… well… an old saw. These new-and-improved skylights can benefit a home in several eco-friendly ways. 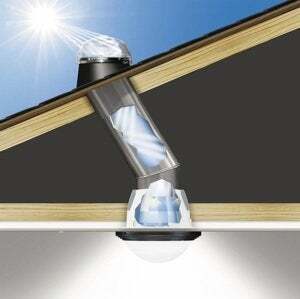 For starters, they beam 100% free light into a room, and if vented, they improve air circulation. Additionally, skylights can help regulate a home’s climate. (Rising hot air escapes through them in the summer, and in the winter, they admit warming sun rays.) Not to mention, the natural light admitted by skylights ultimately promotes good health. Sunlight balances your circadian rhythms, wards off Seasonal Affective Disorder, and replenishes vitamin D levels. Unlike the bubble-style skylights of old, today’s versions are made to the same standards as high-quality windows. Many are Energy Star-rated and feature dual-paned, argon-gas-injected low-e glass that not only insulates well, but also blocks UV rays that can bleach furniture and carpets. One of the more technologically advanced skylights on the market is the solar-powered “Fresh Air” Skylight from Velux. An operable window-on-your-roof, it features solar cells built into the frame, so there is no need to hook up the skylight to your home’s electrical system. Using the preprogrammed remote control, you can either open and close the skylight at will or program it to lift and lower automatically throughout the day. Conveniently, a built-in rain sensor closes the window in wet weather. 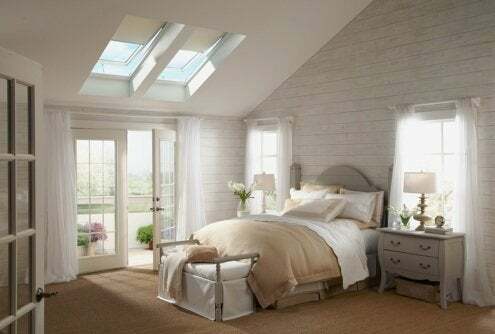 If an attic takes up most of the space beneath your roof, a skylight may seem impractical. Fortunately, you can still let the sun shine in through tubular solar lighting. These systems, some of which are simple enough to install yourself, consist of a skylight on the roof and a fixed or flexible tube that channels the light to wherever you need it. The resulting installation indoors often looks like a recessed ceiling light fixture. A leader in this area is Solatube. The company manufactures a tube-lighting system that features a roof-mounted dome, which collects sunlight from different angles. That light is then filtered down through a tube lined in Spectralight Infinity, a highly reflective material (the most reflective on earth, Solatube claims). Finally, the light is released through your choice of fixture; some impart special effects like warming, softening, or sharpening sunlight that passes through. In the past few years, one of the brightest advances in skylights has come, not from a research facility, but from the federal government. The American Taxpayer Relief Act of 2012 allows homeowners to claim a 10% tax credit—up to $500—on certain components of skylight installation, so if you do install any of these systems, be sure to check with your accountant! That way, you’ll not only save on electric, heating, and cooling costs, but on your taxes as well.